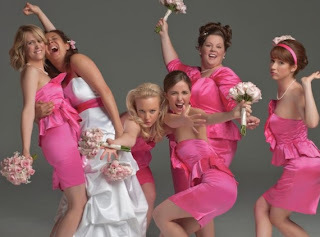 The recently released "Bridesmaids" proves that girls can create laughs and groans with the same uncomfortable and gross humor that guys do. This is the story of Annie (Kristen Wiig) as she agrees to be the Maid of Honor for her best friend Lillian's (Maya Rudolph) wedding. It's pretty clear from the opening scenes that Annie's life is not on an even keel. Add a super competitive rival bridesmaid and things unravel pretty quickly. Another very special part of this movie was seeing Jill Clayburgh pop up on screen. In what I believe was her final role, Jill portrays Annie's mother. It's not a big role, but just so nice to see her again. Overall an enjoyable movie, although I think my daughters might find it much funnier than I did. It's likely an age thing. I think Hubby and I are going to see this weekend! ha ha- I just looked back to see if you had posted about this. I LOVED LOVED LOVED this movie. OK, if I had to do reviews everything would get an A b/c I don't get out much and enjoy everything, but I think I laughed more during this movie than any other movie. I'm going to make my husband see it tomorrow. Hopefully it will have appeal to men too.